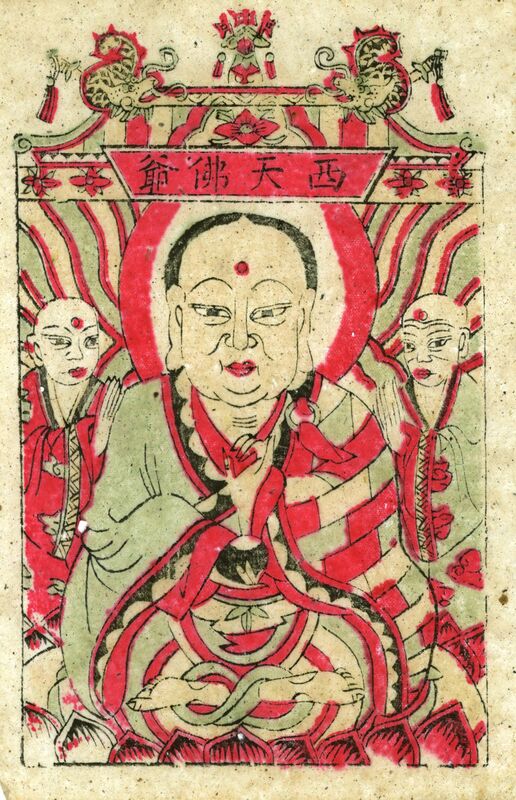 The title of this wood block print is called “Buddha of the West Sky”, referring to Siddhattha Gotama of India. The idea of the West Sky is complex, in the early days the sun is believed to be a godly object; raising from the east, watching us on the day and going away and setting on the west. It is believed that while we sleeping the sun will be watching over in the west sky. With Buddhism introduced to China from India, a country to the south west, India, the West Sky, is the place where the truth, the important scripts are. Monks, notably Xuanzang (depicted in the novel the Monkey King), went to India to find enlightenment. The West Sky symbolizes a cleansed soul and mind, a nirvana world.